I Thought this weekend during my Brew day, I'd take pictures of my upgraded system, and decided I'd document my process. 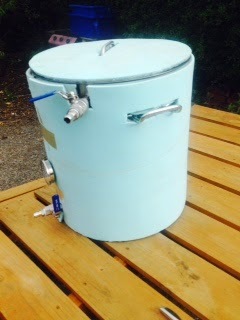 However the HLT Urn I bought off Trademe (NZ equivalent of E-Bay) had a substantial leak in it. There goes my plan to work a new system. 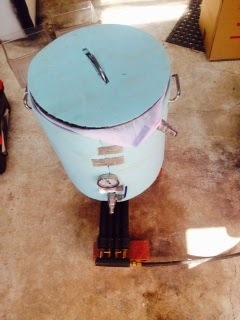 I used Basic Camping Mat to Insulate the MLT. I'll detail my recipe in this post to give you an idea of what's what and why is looks like ink.... lol. So away I went, and to be sure of no screw ups I took my time, I filled my new shiny with 36 Litres of Tap Water, and turned the burner on. A Strike Temps of Around 69 was required, I normally gets 3-4 degrees of heat loss once the grains are added. Just a quick side note on BIAB and heating etc. Please be careful to stir the pot to maintain an even temperature through the whole body of water. this makes sure all the heat from the bottom is being utilised, thus making your heating slightly faster, and getting an even temperature across the board. that, I remove the bag and suspend it slightly for a minute before hanging it from a big hook I have in the garage, below of course is a Pot to collect the additional Wort. 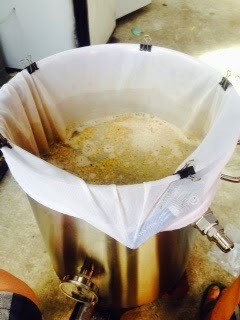 then Boil and Add the Hop additions as normal. I'll add the Immersion Chiller 15 mins before the end of the boil (After a quick Water spray to remove dust) and that'll sufficiently sanitise the chiller. I gave this a 15 min Whirlpool/hop steep, before turning on the chiller, and whirl-pooling again, to get full wort contact. I hit 65% efficiency on this, which was a shame, but only 4 points away from the normal target. 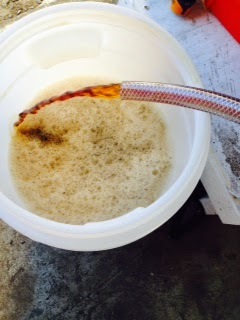 I shook the fermenter, and then used my aquarium pump for 30-40 minutes for full aeration, and then pitched the yeast. 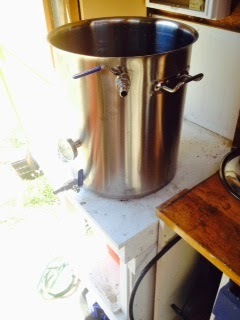 Simple process, short brew day. Mostly, the clean up is what takes the time. Most people mention this, and you've heard it all before, make sure everything is clean and sanitised.